A Granola Trifle layers granola with yogurt and fresh fruit. Normally, when you think of a trifle, it consists of cake, custard, and fruit which gives you a nice contrast in tastes and textures. For this breakfast trifle we have simply substituted granola for the cake, yogurt for the custard, and the fruit can be whatever is in season. I like to serve the trifle in parfait or wine glass so you can see all the wonderful layers. As the name implies, this trifle begins with granola, which is simply a mixture of rolled oats, nuts, and sometimes coconut that are moistened with oil (or butter) and maple syrup (or honey) and then baked until golden. While you can use a commercially made granola, this cereal is a snap to make, so I have included a recipe for making your own. I like to use old-fashioned rolled oats, not quick cooking for making granola. The difference between the two is their thickness. Old fashioned oats are thicker because to make quick-cooking rolled oats the oat groats are first cut into pieces before being steamed and flattened. Although they are often interchangeable in recipes I recommend using old-fashioned rolled oats in this recipe as I prefer their thicker texture and better flavor. Once you have the granola in hand, next comes the yogurt layer and you can use any flavor of yogurt you like. The final layer is fresh fruit, and again, you can use whatever fruit you like. While your choice will often be influenced by season, some excellent choices are bananas, mangoes, pineapples, oranges, berries, apples, pears or melons. It is best to make these trifles shortly being serving so that the granola stays crisp and crunchy. But what I often like to do is to simply let each person make their own so that they can make their trifle as large, or as small, as they like. This trifle's roots seem to be in Scotland. It is there that I found a recipe in F. Marian McNeill's Recipes from Scotland for what is called a Scottish Cranachan or Cream-Crowdie that combines toasted rolled oats (coarse oatmeal) with whipped cream that is flavored with Scotch whiskey or rum. There is also the suggestion to add a handful or two of fresh berries for sweetness. Blueberries, raspberries, or brambles were suggested. Another similar trifle recipe was found in Orlando Murin's Dangerous Desserts for a Highland Flummery which again takes Scotch oats browned in butter and sugar and layers it with a flavored whipped cream topped with fresh berries. Both of these recipes sound delicious and since whipped cream is used instead of yogurt it would make for a delicious afternoon snack or even a hearty winter dessert. Definitely worth a try. Granola: Preheat oven to 300 degrees F (175 degrees C) and place rack in center of oven. Either butter or line a baking sheet with parchment paper. In a large bowl combine the rolled oats, coconut, nuts, ground cinnamon, and salt. In a small bowl, stir together the melted butter (or oil), and maple syrup (or honey). Pour this mixture over the dry ingredients and toss together, making sure all the dry ingredients are coated with the butter mixture. Spread onto the prepared baking sheet and bake for about 25 - 30 minutes or until golden brown, stirring occasionally so the mixture browns evenly. (The browner the granola gets (without burning) the crunchier the granola will be.) Place on a wire rack to cool. You will notice that the granola may still be sticky when it is removed from the oven but it will become crisp and dry as it cools. Make sure to break up any large clumps of granola while the mixture is still warm. Once the granola has completely cooled, store in an airtight container or plastic bag in the refrigerator. It will keep for several weeks. Makes about 4 cups of Granola. 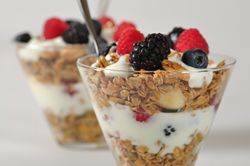 For the Granola Trifles: For each individual trifle; place some granola in the bottom of your glass or bowl, followed by a spoonful of yogurt, then some fruit, and, if you have room, repeat the layers. Use as much or little, as you like, of each ingredient.